Three-time Light-Heavyweight World champion Chad Dawson has been one of the cornerstones of the Light-Heavyweight division for much of the last decade. Having engaged in battles with the likes of future Hall of Famers Tomasz Adamek, Glen Johnson, Antonio Tarver, and most recently Bernard Hopkins, Dawson has emerged as one of the elite fighters of the division and one might argue a player in the sport’s mythical pound for pound ratings. After a grueling and rough fight in his rematch with Bernard Hopkins, Dawson made what some would say was a curious choice by electing to drop down from the 175lb. Light-Heavyweight division to the 168lb. 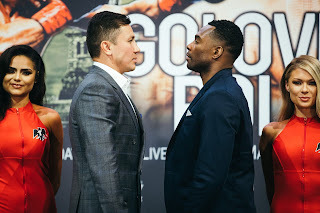 Super-Middleweight division to challenge the undefeated Super-Middleweight champion and division kingpin Andre Ward for his title on September 8th of last year. In that fight Ward dominated Dawson with crisp combinations, knocking the WBC Light-Heavyweight champion down three times in route to a tenth round technical knockout as Dawson informed Referee Steve Smoger that he did not want to continue. Ward’s speed and skill were simply too much for Dawson on that evening. Some may speculate that Dawson’s performance in that fight could have been the result of over training and Dawson himself said that he struggled to make weight prior to the fight. This observer however believes that Dawson simply had a bad night at the office against a fighter in Andre Ward who was simply that good and too much for Dawson. Following nearly a year of inactivity Dawson returned to the ring on June 8th to defend his WBC Light-Heavyweight world title against contender and knockout artist Adonis Stevenson. The fight took place in Stevenson’s hometown of Montreal, Quebec, Canada. Stevenson who was previously ranked number one in the world by the International Boxing Federation (IBF) in the Super-Middleweight division entered the fight with Dawson with an impressive record of 20-1, with 17 Knockouts having a career knockout percentage of over 80%. Stevenson’s lone defeat as a professional came in 2010 when he was stopped by veteran contender Darnell Boone. Since that loss Stevenson was able to score seven consecutive knockouts including avenging his loss to Boone in his last fight prior to meeting Dawson. This was an intriguing fight because you had the aggressive come forward pressure style of Stevenson against Dawson who has hand speed and the ability to be elusive. Dawson however had shown a willingness to stand and trade with his opponents, most notably in his first fight with Glen Johnson in 2008. It was interesting to see how Dawson, coming off a knockout loss, the first of his career would take on a fighter who can end it with one punch at any given time. Stevenson also had been extended to a twelve round distance only once in his career when he scored a twelfth round stoppage of Super-Middleweight contender Don George in October of last year. Despite his impressive and intimidating career Knockout percentage Stevenson was stepping up not only in weight class but also, in quality of opposition in this fight against Dawson. Questions of “Is it too much, too soon? “ or, “Can he handle the magnitude of the event?” were only natural that a fighter challenging for a world title for the first time in his career would have to answer. It was also interesting in the eyes of this observer to see if Dawson could use his experience to nullify Stevenson’s pressure and punching power to extend the fight into the later rounds. Stevenson however had other plans… The fight came to a sudden and dramatic conclusion before it could really get started. Stevenson landed a beautiful left cross on the side of Dawson’s head sending him down to the canvas. Dawson gamely made it to his feet however was very wobbly and incoherent prompting Referee Michael Griffin to stop the fight just seventy-six seconds into the first round. Some may question the stoppage and will likely say that Chad Dawson deserved the benefit of the doubt and should have been allowed to continue. For those who question the stoppage of this fight allow me to present a little historical perspective and a quite similar scenario that may clear up any confusion as to why Griffin ended the contest. On July 21, 1989 Mike Tyson then the undisputed, undefeated and perceived as invincible Heavyweight champion of the world defended his crown against longtime top contender Carl “The Truth” Williams in Atlantic City, New Jersey. Williams who had previously fought for a version of the Heavyweight title losing a highly disputed decision to Larry Holmes in 1985 was knocked down by Tyson with a perfectly timed counter left hook that landed flush on the jaw midway through the first round. Williams arose from the knockdown on wobbly legs, incoherent and unable to respond to Referee Randy Neumann which forced Neumann to stop the contest just ninety-three seconds into the fight. Many questioned the decision of Referee Randy Neumann. The basis of some of the criticism of the stoppage was that Williams had been knocked down seven times previously in his career before getting in the ring to challenge Mike Tyson. Williams was floored twice in his fight with James “Quick” Tillis in 1984, floored twice in his fight with Jesse Ferguson in 1986, and stopped after being knocked down three times by former Heavyweight champion Mike Weaver that same year. Williams was able to recover in his fights with Tillis and Ferguson to win both bouts. On this basis some including Williams himself believed that he should have been allowed to continue. Neumann however provided as legitimate an explanation as you could ask of a Referee following the stoppage. Neumann stated that Williams wasn’t standing upright and was leaning on the ropes, and he could not respond to Neumann when he asked Williams “How do you feel?” After getting up from the knockdown, Neumann also stated that Williams’ eyes were in his words “Blank.” It was as good of an explanation and justification that anyone could ask for from one of the best referees in the sport. Twenty-four years later Dawson-Stevenson ended under near identical circumstances. As Referee Randy Neumann provided a legitimate explanation twenty-four years ago, so too did Referee Michael Griffin after his stoppage of Dawson vs. Stevenson Griffin stated that he wanted to give Dawson every chance he could to continue but he did not respond and he did not have his legs. Although some may be angry at the stoppage of this fight Michael Griffin’s explanation is really all you can ask for. As I have said many times over the years, in Boxing anything can happen at any given time and that is what makes our sport so great. Simply put, one punch can end a fight at any time. With the win Adonis Stevenson has legitimately emerged as a new star in the sport of Boxing in winning the WBC World Light-Heavyweight championship in devastating fashion. Stevenson has several options on the table in both the Light-Heavyweight division and the Super-Middleweight division. Stevenson for his part called out former Dawson opponents in IBF Light-Heavyweight champion Bernard Hopkins and Super-Middleweight champion Andre Ward for potential fights. In the immediate future however it may be more likely that Stevenson will make the first defense of his world title against current World Boxing Council (WBC) number one Light-Heavyweight contender Tony Bellew of England. As for Dawson although there is likely anger from fans, Dawson, and his camp over the stoppage one might argue that by stopping the fight when he did Referee Michael Griffin in all likelihood saved Chad Dawson from being seriously hurt. It is an old saying that this observer firmly believes in “It is better to come back and fight another day than potentially risk permanent damage.” Although some may say that Dawson should retire after suffering back to back knockout losses, this observer believes that Dawson after a long tenure at or near the top of the Light-Heavyweight division, having fought the best fighters in the division, that he has earned the chance to have a long rest to allow his body to recuperate. It is possible that the drop down in weight to fight Andre Ward as well as going back up in weight to fight Adonis Stevenson may have taken a lot out of Dawson. Let’s not forget twelve years of wear and tear totaling thirty-six professional fights including two no contests would be a lot for any athlete to overcome. Dawson is still a force to be reckoned with in Professional Boxing and he deserves this time to fully evaluate his options before making any decisions.